Deeg - definitely worth a detour! The Palace Gardens at Deeg are stunning – located just 25 miles north of Bharatpur, with its famous bird sanctuary – they are worth taking a detour for. 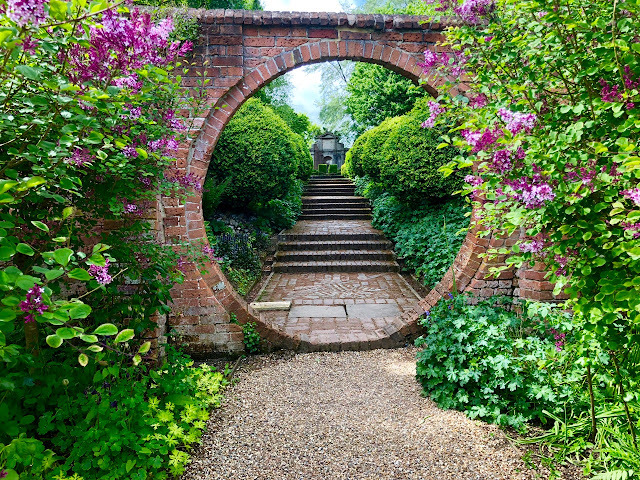 Built by the Jat rulers in the 18th century, these gardens rose to fame recently, when featured in Monty Don’s TV series “Around the World in 80 Gardens”. 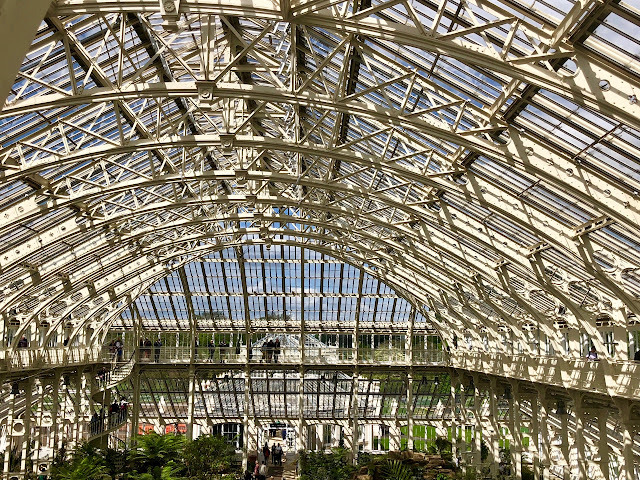 It’s easy to see why, even if they are in a state of disrepair at present, but you certainly wouldn’t know they were famous, because even in peak tourist season, they were completely devoid of visitors. All the palaces at Deeg are stunning. 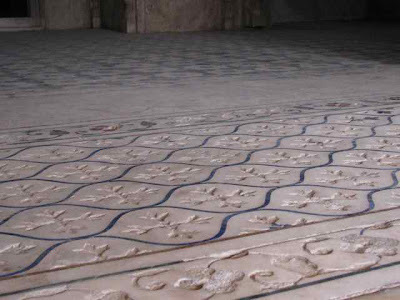 They are laid out in a quadrangle and at either end of the complex there are two huge water tanks, which mean that the lower floors of some of the palace buildings are submerged in water (above). But even though the buildings are well maintained and filled with interesting furnishings, the main attraction for me was the gardens, which provide an oasis in the middle of this dusty town. What is clear, is that work is being carried out to restore these gardens to their former glory and I sat and watched spellbound whilst women in traditional Rajasthani dress carried loads of soil on their heads to the area where they were planting in the middle of the garden (below). 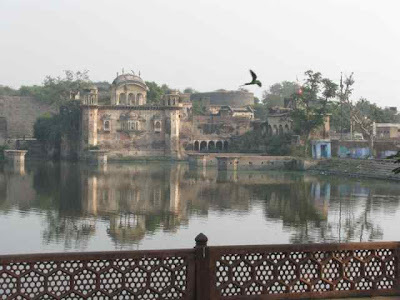 But the main feature here is the fountains – more than 2000 of them - laid out in classical Mughal designs around the gardens, and fed by a huge tank atop one of the palaces in the complex which holds 6 million gallons of water. I’m sure they’re magnificent when functioning, but nobody at Deeg could actually tell me when this happens! 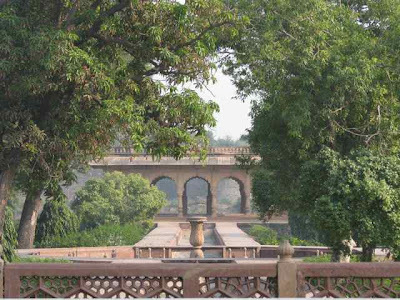 A broad terrace with a central watercourse links all the palaces and pavilions in the complex and the central garden is an extended Persian chahar bagh design divided into sixteen sections, where planting is currently being carried out. 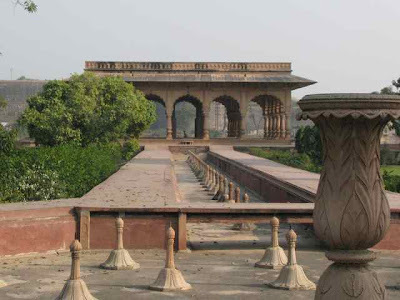 The Jat rulers were much influenced by the magnificent mughal courts at Agra and the palace complex at Deeg is reminiscent of the Taj Mahal with one palace, the Suraj Bhawan built entirely of marble and with inlaid floors (above) and wall decorations. Deeg was also used in the film, Siddharha, based on Herman Hesse's novel. So beautiful. I can't complain about having to wheelbarrow soil anymore. Amazing concept and construction. A veritable spectacle in its day, I'm sure. I thoroughly enjoyed Monty's series. Your post has compelled me to catch that episode again. Thank you ! Oh my goodness. So beautiful, yet so foreign to my eyes. 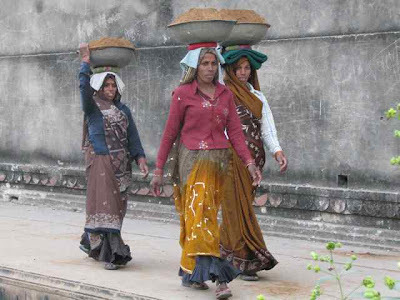 I also just love the dress of the local women, although I would not like to carry soil on my head. Hi Tiggerlot, I kept thinking, give those poor women a wheelbarrow. :) I love the containers they're using. The whole place looks like a fantasy with so much attention to detail. I've not seen Monty Dons programme. Those gardens in their former splendour must have been incredible. The Palace at Deeg must have been an amazing place to visit - that water Charlotte was it always there or have those ground floor rooms just been flooded in the last few decades? A compelling piece about a mysterious spot, Charlotte. It makes me want to see more, learn more. Thank you. 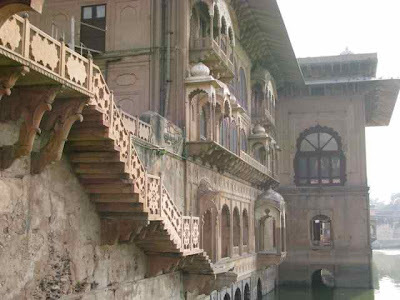 I haven't been to Deeg but next time I'm in Rajasthan, the places mentioned here will be a must-see for me! I look at your photos and just *sigh*...such pretty images you see through the lens...thanks for another wonderful tour of your travels! i m frm deeg & ur photos r amazing.